A guide to planning your Christmas and New Year's in the Utah mountains. Celebrate the holidays in Park City with fun-filled days and nights at the resorts and out on the town. Traditions big and small are one of the great things about the holidays. Here are some of our favorite Park City celebrations that you can count on year after year. If you plan on Park City Mountain being your playground during the holiday season, you can count on celebrating Snowfest (Dec. 22, 2018 through Jan. 6, 2019). The annual resort festivities typically last a little over two weeks and include a variety of daily après concerts and family-friendly activities, from free s'mores to building gingerbread houses and ice sculpting at both Park City Mountain base and Canyons Village. Of course, the major annual festivities of this multi-day après extravaganza take place on Christmas Eve when the resort hosts its Torchlight Parade as well as the New Year's Eve Celebration and fireworks show (more below). You can check out the full line-up of this year's Snowfest events here. What Christmas would be complete without a visit from the white-bearded man in red? While Santa makes it a point to show up in Park City for the first time every year during Thanksgiving, there are also plenty of chances to spot him in December when he makes regular stops at both Deer Valley Resort and Park City Mountain. 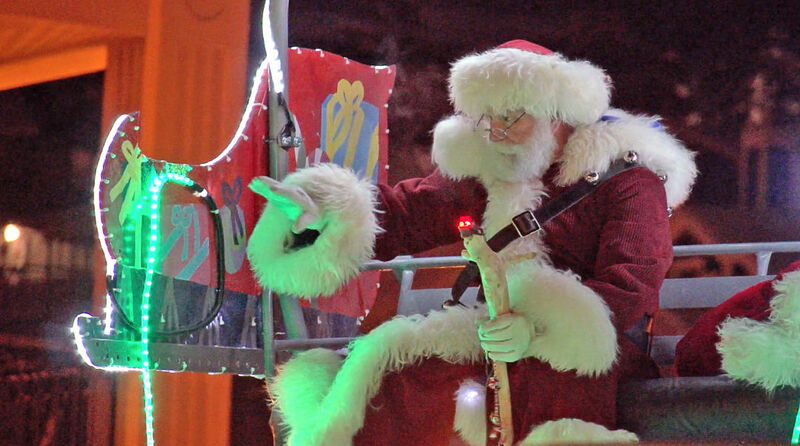 The kiddos can catch Santa as he comes down Town Lift (this year Dec. 15 @ 5:30 p.m.). To combat the cold, the annual event is always accompanied by complimentary hot chocolate, cookies, and live tunes. Santa also makes it a point to stop at Deer Valley Resort's Snow Park Lodge and Silver Lake Lodge every December 24. Make sure you bring you camera so you can snap a pic! If a visit with Santa is a must and you miss him at the resorts, you can still catch him at a few other locations, most notably Heber Valley Railroad's 90-minute North Pole Express, complete with hot cocoa, Mrs. Claus' famous chocolate chip cookies, and, of course, some time with St. Nick. Ever seen a piece of food too beautiful to eat? If your answer was no, then you clearly haven't stopped into the Stein Eriksen Lodge during December. For 17 years now, the pastry team have been taking the gingerbread "house" game to the next level. Inspired by movies and more traditional holiday themes, they create massive gingerbread art displays, which in years past has included a ridiculously detailed replica of Hogwarts (Harry Potter), an 11-foot tall AT-AT walker (Star Wars), a massive whimsical carousel, the Eiffel Tower, and the Empire State Building to name a few. This year, you'll find yourself face-to-face with an authentic gingerbread Viking ship, a tribute to the Norwegian heritage of the lodge. Arguably the most magical evening of the Park City Mountain's Snowfest celebration is the annual Torchlight Parade (Dec. 24). Held since the resort first opened, the event is one of our town's longest-running traditions. As the sun fades behind the mountains and darkness creeps in, the resort itself lights up as staff carrying torches weave their way down the slopes, creating a dazzling display and setting a special holiday atmosphere as only ski towns can. Holiday music and activities begin at 5:30 p.m. at the Park City Base Area. 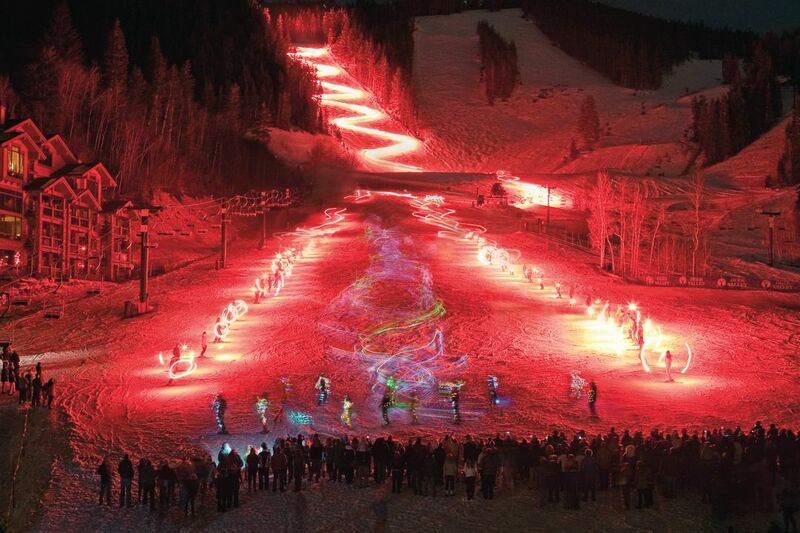 For a similarly dazzling Torchlight Parade experience, gather at Deer Valley's Snow Park Plaza to sip complimentary hot chocolate and nibble gooey, freshly baked cookies while watching the skier-created, string of lights snake it's way down the Big Stick ski run on December 30 at 5:30 p.m. The Seafood Buffet remains open during the event so you’ll also have time to tuck into a feast afterwards (be sure to make reservations). Close the year out with a spectacular fireworks display and celebration at Park City Mountain December 31. Keep things casual and party outside on the slopes with live dance music from Metro Music Club. For a slightly warmer evening, join the annual party inside The Grand Summit Hotel, which includes a buffet dinner, cash bar, dancing, and midnight balloon drop (reservations required, 435-615-3336). If you're the type who prefers ringing in the New Year with alcohol in hand and all-night partying, Main Street is your best bet. While parties and performers vary from year to year, the Park City Live NYE Black & White Masquerade Ball is a staple. Dress in black and white and prepare to dance the night away with beats from a celebrity DJ. This year, DJ Ross One, who recently signed onto Jay-Z's Roc Nation, will be in the house spinning. More info parkcitylive.net. Ballet West Academy presents a timeless classic on December 22 when they perform The Nutcracker at the Eccles Center. In addition to the annual holiday traditions, Park City also hosts an eclectic array of entertainment for all ages. Here are a few of the highlights. Check into one of Main Street's best live music venues O.P. Rockwell for the AIKO New Year's Eve Party. Rooted in folk, country, classic rock, and psychedelia AIKO's feel-great music closely resembles that of the Grateful Dead and the Allman Brothers. Before the show, O.P. Rockwell will also host a reception and gourmet dinner. More info and tickets available at shows.oprockwell.com. Of course no holiday would be complete without a fantastic meal. Rest assured, Park City restaurants are here to serve, if you need a couple suggestions we have you covered with Five Feasts Worthy of Holiday Indulgence.